PCA LADIES - Time to order your Women's Ministry t-shirt!! Please fill out the attached form. If your size is not listed, please add it to "other information" . This T-Shirt will be a medium gray, the design "Jesus" on the front will be in white letters. On the back will be that famous quote by Sandi Bardwell "think about it..." in white lettering. It will also have our PCA logo on the sleeve also in white. Don't be the only one not wearing one. Cost is $14 for sizes small to Xl. $16 For 2XL $17 for 3XL $18 for 4XL. 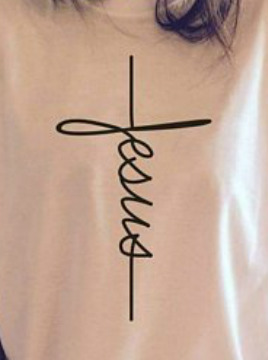 Besides being a fashion statement you can wear this to show the world Jesus!